The Propaganda Game. Directed by Alvaro Longoria. Spain: Morena Films, 2015. DVD, 98 min. Under the Sun. Directed by Vitaly Mansky. Russia: Vertov, 2015. DVD, 110 min. What is truth and what is propaganda? How do documentaries fit into those paradigms? Two films that came out in 2015 attempt to answer those questions vis-à-vis North Korea. One is The Propaganda Game, by Spanish filmmaker Alvaro Longoria. The other is Under the Sun, by Russian filmmaker Vitaly Mansky. They each do it very differently, however. One divides its screen time nearly equally between a North Korean and a collective “foreign perspective,” perhaps chasing journalism’s unattainable ethical summit of objectivity. The other is epistemically far more complex, as the filmmaker presumably agreed to shoot a scripted, archetypical version of a child’s life, but instead turned his attention to the highly managed staging of that idealized story. 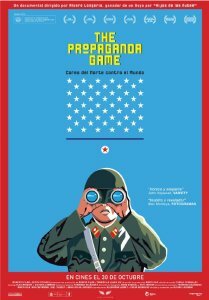 The Propaganda Game describes the DPRK as “the perfect battleground” for foreign and domestic propaganda, while Under the Sun considers just one side’s tactics for information control. It is useful to see the films in tandem, but Under the Sun is still on the festival circuit and remains hard to get ahold of. The Propaganda Game made its festival debut last fall and is now available on DVD and Netflix in some countries. The central premise of The Propaganda Game is spelled out at one point by a self-proclaimed foreign spokesman for North Korea, Alejandro Cao De Benos, who says quite clearly, “this is a war” and he is proud to be playing his part. Cao De Benos is the head of the Korea Friendship Association, a pro-DPRK organization that generally promotes North Korean positions and organizes trips to the country. It was through him that the filmmakers gained entry to North Korea. The film’s other foreign commentators, who are mostly eminent scholars and journalists, don’t frame their role as such. The filmmaker’s back-and-forth editing and pacing, however, make it clear that he agrees at least partially with the framing of Cao De Benos. At one point in the back and forth, outside commentators are shown calling the country “mysterious,” or some version thereof. Then, Cao De Benos gives a rebuttal: “OK, that’s fine, it’s true. It’s a secret country, you can see that. It’s a fortress. We are very much protecting our system.” In other words, it is intentionally difficult for outsiders to learn about the DPRK. The filmmaker also exposes absurdities in foreign discussions of the country. For instance, after a Western newscaster reports that all North Korean males must now get the same haircut as Kim Jong Un, the film makes a quick cut to a Pyongyang hairdresser who offers 15 styles for men. The untruth is immediately exposed. The contradictions can be subtler. In one segment, Barbara Demick, author of Nothing to Envy, notes that “North Koreans are brainwashed from the minute they’re born…almost the first thing they learn to say is, ‘Thank you, Dear Leader.” The film then cuts to Cao De Benos, who provides an innocuous interpretation: “education is very important…since you are a kid, you grow up and you learn to live according to the ideology, to the communism.” One side’s indoctrination is another’s education. During a road trip, the director asks Cao De Benos, “What’s the lie that angers you the most?” He responds, “It’s that our Korean people, my comrades, they are forced to believe in our system. Like there is someone…a soldier with one machine gun pointing at each one of our citizens to force them to follow our system.” Of course, no one makes this claim. Rather, other commentators (notably, North Korean defector Yeonmi Park) point to the lack of information outside official channels and to restrictions on interactions with foreigners. Cao De Benos frames human rights concerns as part of a discourse tied to global capitalism and American power. Whereas, Justice Michael Kirby, the lead author of the UN Commission of Inquiry on DPRK human rights, then argues that human rights are a brute fact. Under the Sun, which was produced with Russian and European funding, sets out to follow Zin-Mi, a young girl who is joining her country’s Young Pioneer Corps. From age nine, all North Koreans join the Young Pioneers; in a very real sense it is their introduction to an intense, state-organized life. The film begins to cover this induction as the North Koreans would like to portray it, and then it veers sharply away after an unexplained dispute between the Korean and Russian sides. Even the officially sanctioned content offers much to learn. We see aspects of schooling in North Korea that are steeped in indoctrination. The fatherland and the leaders feature in almost all aspects of education. Mansky’s camera dwells on a lesson about Kim Il Sung’s life and how he “taught us to hate imperialists.” In North Korean schools, kids’ songs include catchy titles such as “I want to see Comrade Kim Jong Un.” Schools have large signs thanking Kim Jong Un, encouraging students to “learn for Korea,” or both. Central to the story is the swearing-in ceremony for the Youth Pioneers, where elderly war veterans call on the children to “be reliable reservists of the Juche movement” that goes “from generation to generation,” an injunction emphasized when the veterans tie a symbolic red scarf around each child’s neck. The documentary explores other aspects of school, social life and Zin-Mi’s induction, but it starts to take a turn as it portrays her family. In one scene around the dinner table, Zin-Mi’s dad discusses kimchi and claims that it provides all essential vitamins. Zin-Mi exclaims that it also “prevents aging and cancer!” The family members all laugh heartily. The film then cuts to show them sitting in different positions. They repeat their lines. A Korean filmmaker is heard saying, “Don’t act like you’re acting in [a] movie. Act naturally, like you do at home.” The director adjusts how each of them is sitting and tells them to laugh more when Zin-Mi delivers her line about aging and cancer. They run through the scene again. The family laughs more heartily. After this point, the film shifts most of its attention to how North Korean partners of the Russian filmmakers planned shots and storylines to portray a romanticized version of Zin-Mi’s story. A subtitle explains that Zin-Mi’s dad was originally a journalist, but the North Koreans made him a textile engineer to better suit the story. In a discussion with some managers at his factory, he immediately solves a quality control problem. Then we see a factory floor scene run once, then rehearsed and run again. The factory in the first take had exceeded its quota by 150 percent. By the second take, its workers had exceeded it by 200 percent. This candid look at the DPRK’s production process is at times very interesting, but it has encouraged hyperbolic headlines and the assumption that the North Koreans are being dishonest. Are they, though? Documentary filmmakers always disturb, affect and alter the actions of their subjects. This largely goes unnoticed by viewers, who are accustomed to the grammar of documentary film. For example, when a news piece shows a journalist arriving at someone’s door, the subject may shake hands with the reporter without acknowledging the camera that is suddenly in his or her face. Obscuring the filmmaker’s presence requires a level of artifice. Similarly, if a film follows a close-up of a boat captain with a distant view of the boat he is directing down a river, few viewers would contemplate the fact that the captain had to stop, let the film crew out and re-enact what he was doing for the second shot. We assume that this imagined film is trying to represent a truth about our fictional captain—he travels by boat down a river—and let it slide. What sort of film would it be if the director showed every moment of staging and direction and added strange, haunting background music, as Director Vitaly Mansky does? A vastly different one. Would we be mesmerized that aspects of the portrayed scene had been staged? Would we care at all? We would probably judge the finished piece to be a little weird, or boring—possibly a behind-the-scenes DVD extra we would normally ignore as it is outside the bounds of the main narrative. Something is distinctive about Under the Sun, though. It is set up to a greater degree than most documentary films allow, primarily because its cast uses full scripts. The fact that it conveys the desired message of the North Korean state also makes us uncomfortable. The film’s most troubling aspect, however, is that it is invitation to see the North Koreans as duplicitous when it mostly exposes a vast gulf in how we tell stories. I would contend that the North Koreans are not behaving deceptively (in this case, at least). This is simply how they communicate through film. The “actors” know they are portraying an idealized version of their lives and a North Korean audience watching it would know that too. Some of the film’s subjects may feel cynical about that, but many probably don’t—it is simply how they tell stories, and their expectation of verity in a documentary is vastly different from ours. No doubt, the Korean filmmakers feel conned; they had agreed to make one kind of film—their kind—but Mansky made another. One hopes that their careers are not too adversely affected. The film’s ethics are further complicated by the fact that it was intended for a foreign audience. It is here that the The Propaganda Game can help inform our viewing. Will Western audiences understand that this idealized portrayal of life for one child and her family is still based on truth? Or, in our cynicism, will we dismiss it as pure propaganda containing no truth at all? One hopes we will understand that some of its elements are grounded in the facts of daily life while others were confected for the story. Near the film’s end, we see family after family move into frame, posing in front of an arrangement of Kimjongilia flowers before disappearing offstage. Grim music plays in the background, perhaps unnecessarily. The families are dressed in their Sunday best, so to speak. They don’t smile, but Koreans tend not to in portrait photos. They, too, are constructing a moment for friends, family and their future selves. We’re left to wonder what they are thinking and feeling. We’re also left wondering what is real and what is not in images from North Korea. What we are not left with are easy answers to any of these questions. Similar organizations existed in Eastern Bloc nations throughout the twentieth century. Director Vitaly Mansky has alluded to this dispute in interviews. See David González, “Vitaly Mansky–Director,” Cineuropa, November 19, 2015, http://www.cineuropa.org/it.aspx?t=interview&l=en&did=301956. 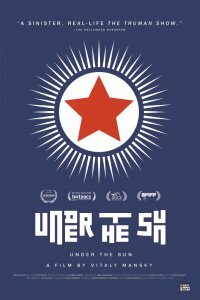 “North Korea documentary Under The Sun: Smuggled footage exposes propaganda machine,” News.com.au, June 26, 2016, http://www.news.com.au/entertainment/movies/north-korea-documentary-under-the-sun-smuggled-footage-exposes-propaganda-machine/news-story/3dc645751ea546e1c2dd1c5e7a6cb5bf.